After last week’s goal-fest it was almost inevitable that a single goal would win this one. Greg Shields had said beforehand that was a "must-win" and after a poor first half Greg himself popped up with a controversial 65th minute winner. Although the Pars have played better and lost this season, they go into the New Year with renewed heart. Jim McIntyre made 4 changes to his starting eleven for this rearranged fixture. With Nipper Thomson laid low with a virus, Scott Wilson came back into the side, and McCann, Loy and Burke were all dropped to the bench with Harper, Bell and Muirhead getting starts. Thus the team lined up: Gallacher in goals, a back four of Woods, Shields, Wilson and Muirhead,, Harper, Bell, Glass and Phinn across the middle, and Kirk and Bayne up front. Before kick off there was 30 seconds applause in memory of Pars legend George Miller who sadly died a couple of days ago. Scott Muirhead returning to first team action. With the temperature hovering around freezing, the match was slow to generate excitement. Elliot caused an early scare when getting free but the Pars defence was helped out by the linesman’s flag (not the first time he was to be of assistance). Ex-Par Roddy MacKenzie fluffed a pass-back in 15 minutes but Graham Bayne couldn’t control his volley from 40 yards, and Nick Phinn got the first shot on target in 18 minutes but McKenzie palmed the ball away low to his right. 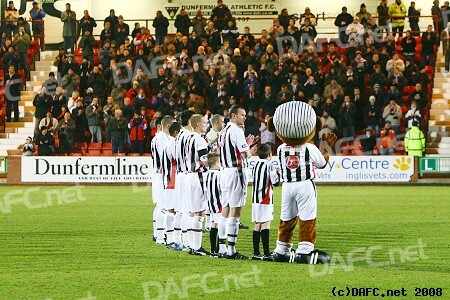 the Pars supporters and current players. 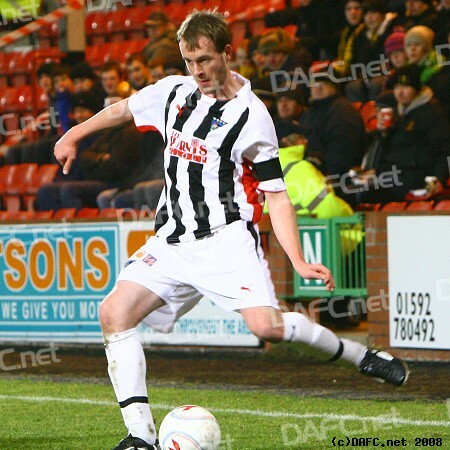 The Pars were forced into an early substitution mid-way through the half when again Harper failed to go the distance, having appeared to land awkwardly when winning a header. Perhaps mindful of the need to nullify Livi’s attacking threat, it was Greg Ross would took Harper’s place rather than the more attack minded Loy, who would be saved for later. Almost immediately Pars physio Gerry Docherty was again in action as Hammill had collected referee Muir who landed in a heap, although still had enough breath to whistle Woods’ break to a halt. Calum Elliot has scored a few goals against the Pars in his time and in 28 minutes he nearly broke the deadlock when grabbing half a yard of space on Scott Wilson and firing in a shot from the edge of the box that Dinger partly managed to block. However, as the ball spun it looked as if it would loop over Gallacher into the net but the Pars keeper managed to tip it onto the bar and behind for the only corner of the half. There were more anxious moments for the Pars when the corner was delivered, Bayne having to scoop the ball clear and then Gallacher clattering Shields while punching clear when the ball came back in. Livi ended the half on top without really looking likely to score. Wilson received a yellow card when he was alleged to have tugged back Elliot off the ball, the Hearts player crashing to the deck 25 yards out, and a minute later Ross was late on Talbot and was also booked. After 12 seconds of injury time (presumably for his own injury) referee Muir brought the half to a close. Half time: Pars 0 Livi 0. Again the second half started slowly but in 51 minutes Greg Ross found himself attacking on the right, looked to have a bit of a mental nose-bleed but cut onto his left foot and swung in a cross to the back post. There was little pace on the ball and Steven Bell could not find the target with a header. Suddenly, now, the game came to life - there’s nothing like some controversial refereeing decisions to raise the temperature a couple of notches. Firstly "Sparky" Griffiths was upset he wasn’t given a free-kick and lashed out at Stephen Glass, who sensibly walked away. The referee flashed yellow, although red was an option. Next the Pars had a great chance, but the ball wouldn’t sit for Bell and when he managed to dig the ball out to Kirk, the Pars leading scorer took an extra touch and his shot was blocked for a corner. In 55 minutes Scott Wilson was light with a pass to Bell and as Miller intercepted and ran through Bell chopped him down to stop further damage. A definite yellow card, but Elliot joined the Pars midfielder in the book when he suggested to the officials that Bell’s punishment should be more severe. McPake was instrumental in calming down his team-mate, but should have listened to his own wise counsel when he in turn chopped down Phinn in the middle of the park in 58 minutes to become the 5th player cautioned. McKenzie made a great flying save to deny Bayne when he latched onto Muirhead’s header, diving high to his left to palm clear, before the Pars made their second change, replacing Kirk with Loy in another straight swap. The Pars were enjoying a good spell, a fine cross-shot by Bayne flashed just wide then in 64 minutes Bayne was denied from close in, the ball broke to Loy 4 yards out but somehow Innes kept the youngster’s shot out when a goal seemed a certainty. There were loud shouts for handball but the referee was satisfied with awarding a corner. Glass took an inswinger which was defended at a cost of a corner from the other side.